Portable Remote Lighting is essential equipment to a fire scene. 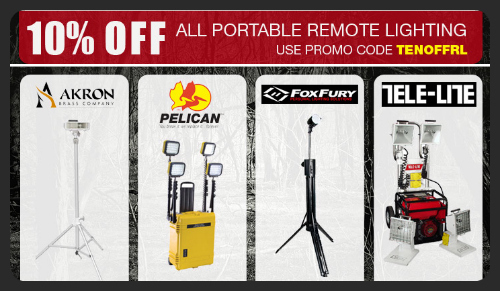 At TheFireStore.com we offer portable lighting from great brands like Akron, Fox Fury, Pelican and Tele-Lite, all catered to fit your different needs and preferences. We carry lighting systems with generators attached to keep the power going for extra dependability in those emergency situations, or we have lighting that's equipped with a rechargeable, high-powered LED spotlight. There are different options to choose based on your needs and budget. Through tomorrow we're helping you with the budget part by giving you and extra 10% off on all remote, portable lighting systems. So, save big and light up your scene today! You MUST enter promo code “TENOFFRL” for 10% off portable lighting products. Discount will not be applied unless promo code is entered on the cart page. Clicking on refresh cart button will calculate and display savings. Good for online orders only, is not valid in-store, and is scheduled to end at 11:59 AM EST on Thurs. Sept. 22, 2011. Offers not applicable on previous orders. Some restrictions may apply.